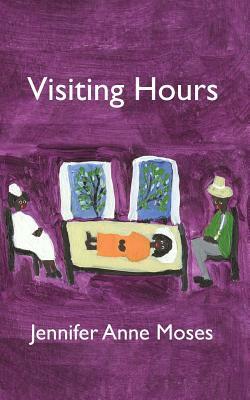 Visiting Hours, a novel-in-stories, explores the lives of people not normally met on the page---AIDS patients and those who care for them. Set in Baton Rouge, Louisiana, and written with large and frequent dollops of humor, the book is a profound meditation on faith and love in the face of illness and poverty. Jennifer Anne Moses is a writer and painter. Other books include Food and Whine and Bagels and Grits: A Jew on the Bayou. She lives with her husband, three children, and two mutts in Montclair, NewJersey.